Last week, the A Grade Ahead academy students completed Curriculum Test 1. This week, we’re offering them a free fairytale coloring page as a reward. Here is a pdf of the coloring page so that you can download it and color it, too! 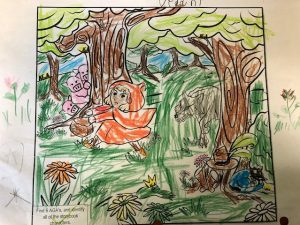 Just for fun, Nicole also hid several AGAs in the artwork so that students can enjoy finding them as well as coloring and recognizing the stories pictured, and the students seemed to like that – that’s the first thing they did when getting their coloring sheets. They found all the AGAs. They also had fun coloring. 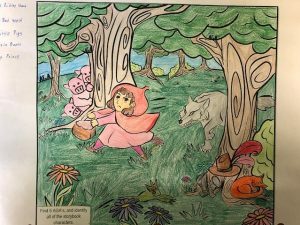 Here’s some of the coloring pages that they have already completed. Did your child like our coloring page? Please, share their work in the comments or on facebook – we’d love to see how they colored it!